An aerial view taken March 19 shows destruction from Cyclone Idai in Beira, Mozambique. Hundreds were feared dead in Mozambique four days after a cyclone slammed into the country, submerging entire villages and leaving bodies floating in the floodwaters, the nation’s president said. CAPE TOWN, South Africa — Two boys at a Catholic boarding school in Zimbabwe are among the more than 300 people killed in the aftermath of a cyclone that slammed into Mozambique, Zimbabwe and Malawi. Officials fear the death toll from the cyclone could reach 1,000. A landslide sent rocks crashing into a dormitory at St. Charles Lwanga Seminary Secondary School in Mutare Diocese in Zibabwe, trapping about 50 students and staff. They dug themselves out, and teachers carried the boys’ bodies for about 10 miles in the Chimanimani district, a mountainous area in eastern Zimbabwe, before the group was picked up by the army and taken to the nearest hospital. 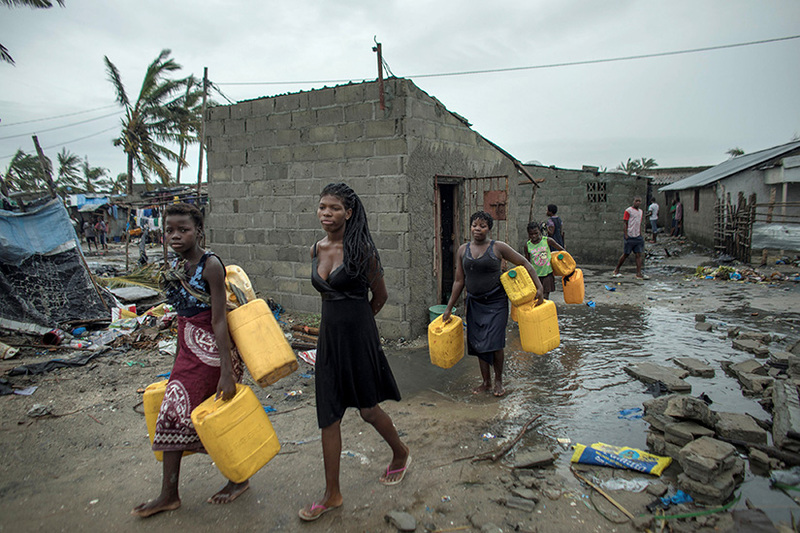 Young women carried containers March 17 in the aftermath of Cyclone Idai in Beira, Mozambique.